This week: The Federal Open Market Committee (FOMC) will make an announcement Wednesday at 2:00 p.m. Eastern Time, with a press conference to follow. Greek negotiations continue. May industrial production data due out today (expectation +0.3%). This week will bring the Federal Reserve Board’s (Fed) next move into focus as they announce its latest policy decision on Wednesday (forecasts updated and press conference to follow). Ultimately, we expect the Fed to continue toward a September hike, given the recent firming in employment and other data. Mixed views have been expressed recently from other members of the FOMC, but the overall message seems to remain that while the economy lost some momentum and there remains a need for continued accommodation, the Fed still plans to move ahead with at least one rate increase this year given what they know today. It is likely that the Fed will seek to quell trepidation over rate increases by flattening the future forecasted rate path when forecasts are updated Wednesday. In September of last year, for example, the FOMC expected short-term rates to reach 2.875% by the end of 2016. Now that number stands at just 1.875% and will most likely be cut again on Wednesday. As we near mid-year with equity indices at record highs, we thought we would take this opportunity to update our long-run forecasts set out at the start of the year. These forecasts help to inform our longer-term strategic allocations. An important aspect of our top-down forecasts relates to the real growth rate for the economy which, we all know, is growing slower since the last recession. Part of the reason relates to structural changes related to labor and we will hear more about this for sure on Wednesday as part of Janet Yellen’s comments. While monetary policy can have a powerful effect on the cost of capital and prices, it can do relatively less to address issues of productivity and workforce characteristics. Output per worker and overall work hours, for example, have been (and remain) weak (chart below). Always tied to the economy over the long term, stock prices are a product of returns from income, real earnings growth, inflation, and to a lesser extent, expected changes in margins and multiples over time. We come to our long-run forecast by examining a series of return contributors beginning with an expected cash return in the form of dividends and net share buybacks. 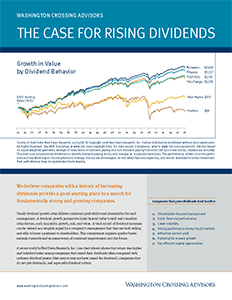 A cash return can be expected from dividends and net share buybacks in the years ahead. A bottom-up estimate from Bloomberg of S&P 500 dividends is now $45.60 for the next 12 months. This implies a forward-looking dividend yield of at least 2.2% for starters. Net share repurchases also offer a real source of cash to shareholders. Since 2010, S&P 500 net share repurchases have been near $30 annually, resulting in an average net repurchase “yield” near 2.5%, which we think can continue so long as cash flow remains ample. In addition to income return, we must account for growth. Real earnings growth should track our estimate for real domestic economic growth of 2.3% plus 0.5% for exposure to faster growing foreign earnings. Since profit margins for the S&P 500 are currently expected to average a record-high 10.4% in 2015 (21% above the 10-year average of 8.6% according to FactSet), we are deducting 2.1% from our annual return assumption to account for some slippage in profit margins as labor markets gradually tighten and wages pick up. We also expect some small valuation adjustment. The forward 12-month price-to-earnings ratio for the S&P 500 based on analyst estimates is 16.8 times $124.64 of expected operating earnings (19% above the 10-year average multiple of 14.1). Amortizing that valuation premium over 10 years suggests a drag of 1.9% expected returns. Adding all this together with an expected inflation rate of 2% leads us to our long-run expected equity return of 5.5%. This return is 3.1% above the current yield on the 10-year Treasury bond. This spread has narrowed since the start of the year when, our long-run expected return was 4.2% higher than the 10-year Treasury yield. On a relative basis, stocks still offer an advantage over Treasuries, but the margin of advantage has narrowed since the start of the year. Real Economic Growth 3.60% 2.30% Slow growth in labor force growth (0.8%) is helped by gradually improving capital investment. Productivity growth reaccelerates toward longer-run average over time. Output per hour, hours worked, and labor force participation rate all are weighing down real output growth below historic growth rates. Inflation 3.70% 2.00% Overhang of credit boom remains for some time to come, limiting inflation. Long-run inflation forecasts implied by real return bonds suggests inflation near our long-run forecast level. 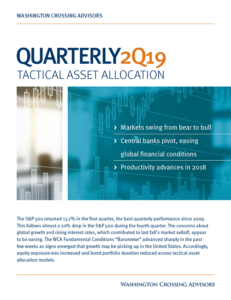 Continued growth, demonstrated commitment by central banks to achieve long-run inflation goals, and narrowing of output gap push back against deleveraging and related deflationary pressures. Cash 4.00% 2.90% Fed set to begin raising rates in the second half of this year. The pace should be slower than prior cycles given slack and the current trajectory of FOMC forecasted rates is down. Longer run expected short-rates are still at 3.75%, but the near-dated expectations for 2016 have fallen from 2.875 to 1.875% over the past several months. We assume the Fed achieves an average short rate near 2% over the next five years before short-rates reach their 3.75% longer term projection for years five to ten. Long-Term Treasuries 5.20% 3.20% Low real rates constrain returns possibly producing negative returns in the near term. Higher reinvestment rates provide some compensation, however, over our forecast horizon. Corporate Bonds 5.50% 4.80% Spreads relatively narrow compared to historic averages, but balance sheets are better too. U.S. Equities 10.40% 5.50% Long-run equity returns are projected to be moderate given slower, but positive, real economic growth, moderation in corporate profit margins as labor markets tighten, continued positive cash contributions from dividends and share buybacks, and some small moderation in valuations. European Equities N/A 4.50% Structural headwinds continue to weigh on growth. Disclaimer: WCA long-run return assumptions updated as of 06/15/2015. Please note that these assumptions and references to future returns are not a promise of return or estimates of return any portfolio might achieve. These are merely WCA's best estimate of future returns and reflect the opinions of WCA as of the evaluation date. This information should not be relied on as recommendations to buy or sell any security. These are forecasts of financial market trends based on current conditions and trends and constitute our judgment about future returns and these opinions may change without notice. We believe the information is reliable, but do not warrant its accuracy or completeness. This material has been prepared for information purposes only and is not intended to provide accounting, legal, or tax advice. All rights reserved. This Web Site Published in the United States for Residents of the United States.